PROVIDES A QUICK BURST OF ENERGY WITHOUT A JITTERY CAFFEINE FEELING: What would you consider an unfair advantage? How about a quick, body-friendly burst of brain-enhancing energy? Call on Unfair Advantage anytime you need a boost without that jittery caffeine vibe. SYNERGISTIC ENERGY FORMULA FOR CLEAN, FOCUSED ENERGY: Unfair Advantage works on the cellular level. It supplies your mitochondria with the raw materials they need to repair themselves and power your body at full-blast. The result is amazing: clean, focused energy that can only be described as feeling on your game. It's just you being awesome. WORKS AT THE CELLULAR LEVEL TO SUPPORT MITOCHONDRIAL HEALTH: Unfair Advantage works at the cellular level, supporting mitochondrial health and efficiency to help the power plants in your cells create energy. Active PQQ is paired with CoQ10, a well known enhancer of mitochondrial function to increase the overall effects. Both CoQ10 and PQQ occur naturally in the body, and are integral to good mitochondrial function and cellular energy production. 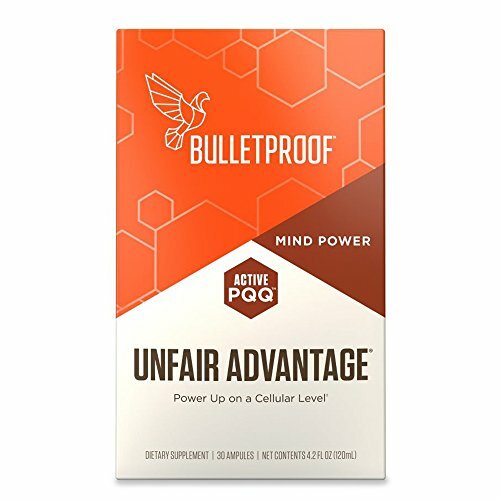 PROPRIETARY DELIVERY SYSTEM PROMOTES ENHANCED ABSORPTION: Unfair advantage features a new proprietary liposomal delivery system uses Brain Octane oil and other special fats to help your body preferentially absorb Active PQQ and CoQ10 to power peak performance.